Pots and pans: Ruffoni. Gold cake platter: West Elm. On fixing up the space: When we first moved in, the Victorian flat was quite run down and higgledy piggledy. The floors are slanted and the doors a bit crooked, but I like that. We also love the big windows, since the rooms get amazing light. We’re on a busy street in South London full of restaurants and coffee shops. Dining table and chairs: vintage. Chandelier: vintage. Table lamp: Anglepoise. On casual entertaining: We love having people over — we’ll do a Saturday or Sunday roast, and our friends will bring their friends. The living room is right off the kitchen, so it’s a great open space to hang out. It’s much more intimate and relaxed than going to a bar or restaurant — especially if you have children. I find that people stay longer, too. 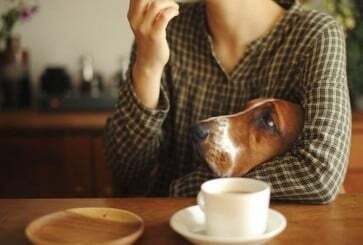 At a restaurant, everyone leaves after the meal, but at home we serve coffee and wine after and people stay late and chat. On bigger parties: I love cooking for loads of people, so I’m very happy when we have an excuse to celebrate something. For my husband’s last birthday, we had about 20 people over and I made slow-roasted pork. (You just shove it in the oven for 12 hours.) My husband loves Pavlova, so I made with one with dark chocolate and one with berries. For my son’s fourth birthday, we cleared out all the furniture in the living room, so the kids could just run around and eat cake. On spices: My husband always jokes, “This is ridiculous, why do you need so much flour?” He doesn’t really get it, but sometimes you need different flour for things! I’ve got plain flour, the really fine Italian 00 flour, self-raising flour, cornmeal flour, buckwheat, strong bread flour and gluten-free if I’m baking for friends who don’t eat gluten — and they’re all labeled on the bottom. When it comes to spices, I use a lot of cinnamon because it’s so warm. On hanging out in the kitchen: When I’m cooking, Aeneas loves to be involved, especially if I’m making pie and he can play with some dough. I have horrible taste in music and basically love 80s pop, but my husband used to play the piano, so he’ll usually put on classical music. 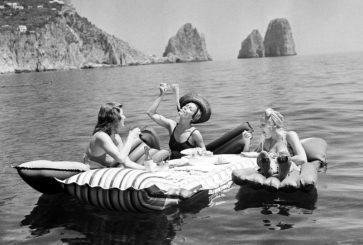 On go-to meals: When it’s just the three of us, we eat quite simply — mostly pasta and fish. Aeneas has always been a great eater, so that helps. He loves artichoke hearts, which are a special treat. He loves pasta with pesto. We have a tiny, tiny terrace with a tiny, tiny BBQ. My husband will make steaks or lamb chops with a salad. Sofa, coffee table and chair: vintage. Pink and white pillow: H&M. On vintage pieces: We have lots of furniture from flea markets and charity shops. Our building is so old that it didn’t seem right to fight against that! I was raised in Venice, Italy, and I love that our chandeliers are from the Venetian glass factories — we found them at a flea market, so they’re slightly chipped. My father was a great collector, and our home felt like a cabinet of curiosities. I think that I’ve inherited a love of quirky clutter from him. On flowers and fruits: Every week or two, I’ll go to the flower market for whatever’s in season. The flowers last longer and are cheaper. Roses last longer, too. I also like putting out bowls of fruit. We obviously eat the fruit as we go along, and when it gets down to the end, I’ll make a crumble or cake. Gold mirror: vintage. 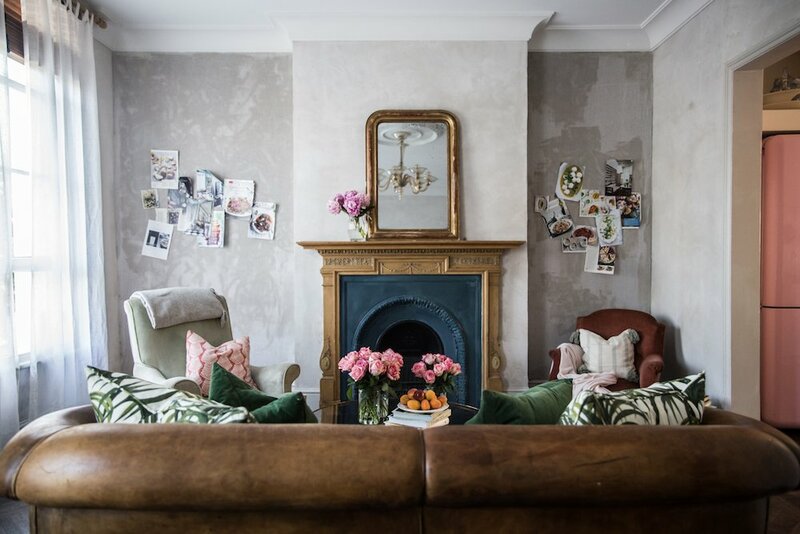 Green pillows: House of Hackney. On mood boards: I have two pin boards up in the living room for inspiration. 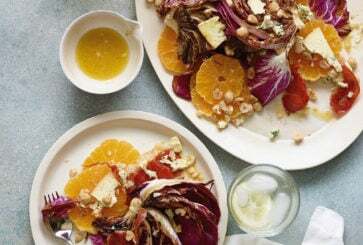 I will pin up recipes with great flavors, ones that were shot really well or just beautiful imagery. They are constantly changing and evolving. Magazines are wonderful, but don’t like them gathering in stacks around the house. So, I will buy one and read it right away, tear out all the inspiring pages, pin them on the board, and then get rid of it. I like Condé Nast Traveller, Food & Wine, Vogue and Cherry Bombe. On blankets: Whenever my mom asks what she should get us for Christmas, I always ask for a rug or blanket. I really love everything to be cozy. Because I work from home, it’s important that this is a calming space and a refuge from the city. 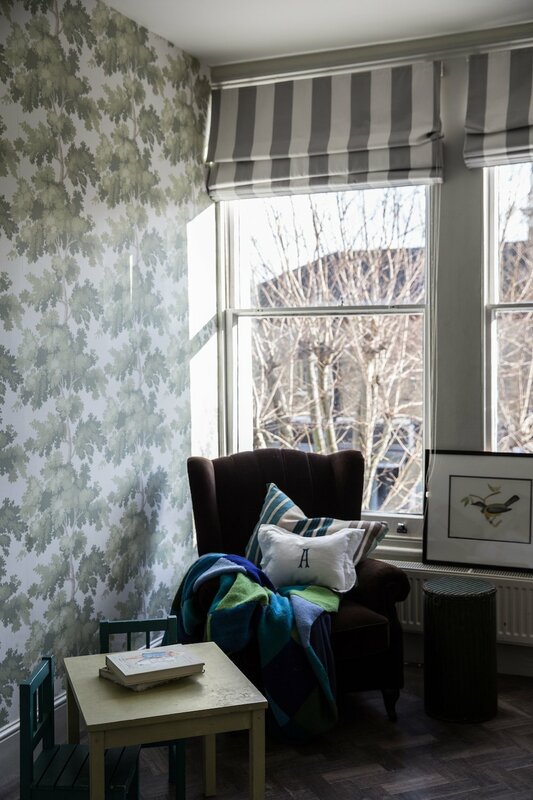 I find London to be quite manic and overwhelming, so I wanted the house to feel warm, welcoming and soothing. 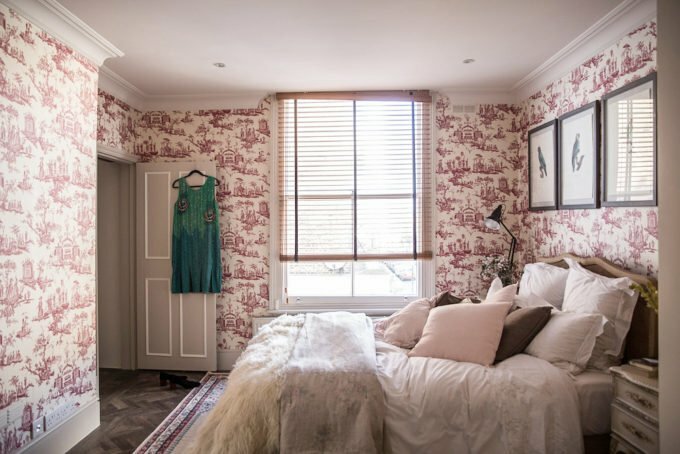 On wallpaper: Wallpaper instantly gives character and warmth to a room. 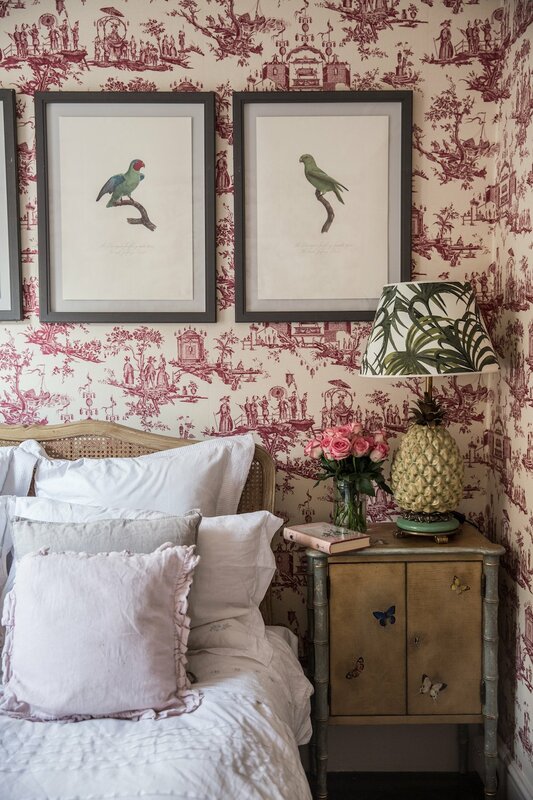 I chose a French toile print for our bedroom. Pink is my favorite color, I find it very soothing. We used to live in a tiny studio, which had a pink fridge and kitchen counters. My husband has gotten quite used to the pink thing. Pineapple lamp: House of Hackney. On birds: The bird prints above our bed came from a book on parrots that my dad gave us years ago for Christmas. My husband loves birds and wildlife. We thought they were so beautiful that it was a shame they were all in a book where no one could see them, so we framed four of them. Pillows: Volga Linen. Blankets: knitted by a friend. On trees: I saw this tree wallpaper at a friend’s house and fell completely in love with it. I wanted something that Aeneas would like, but that wasn’t obviously childish. I thought it was really magical for a little boy’s bedroom because it felt very Robin Hood. On reading together: My son loves playing at his work bench in his room and has tons of Legos. We also read a lot of books together. He loves Peter Rabbit, Thomas the Tank Engine and anything about dinosaurs. I am kind of longing for him to be a bit older, so we can read Harry Potter and the books I loved when I was younger. Thank you so much, Skye! Your home is so beautiful. P.S. More house tours including a rambling Sonoma garden and a city apartment with a cabin vibe. I love the feel of this home. A home and not just a house. It’s filled with meaningful things and gifts from loved ones. You can tell that much thought went into the design and function. Thank you for sharing your home with us! I really love this place. It has a unique comforting sense of style while a touch of rustic just makes it perfect! I would love to have breakfast in this kitchen. It looks so cozy and inviting. I especially like the mason jars on the shelving! This home is swoon worthy! I really enjoyed the photography! I love that big cutting board…. 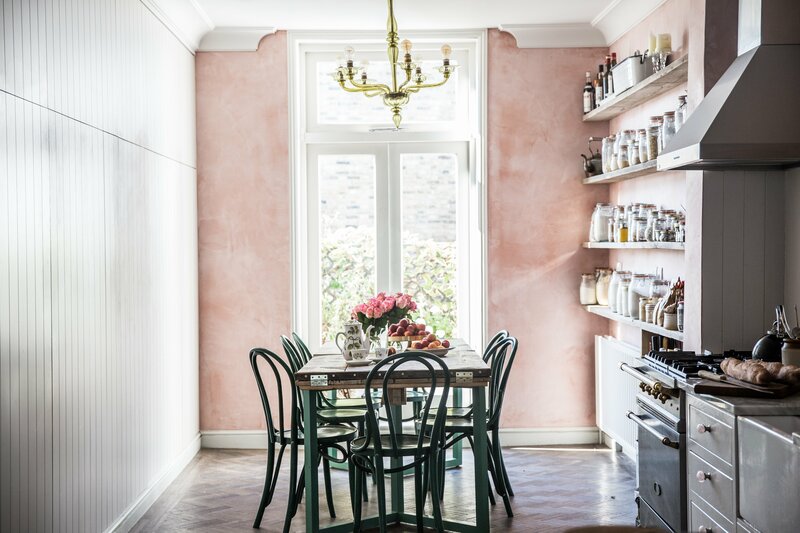 LOVE the pink, worn-in wall color..
Can you tell me; from where is the brass rack in the kitchen? Really thank you!! This house is really gorgeous & wonderful. if you use plants in your home, you will look even better & more beautiful. I am in love with the tree wallpaper. This is so pretty. I love the character this home has. The textures of the home make it look very inviting. Excellent work!! Amazing work by Jersey Ice Cream Company! They are absolutely incredible! 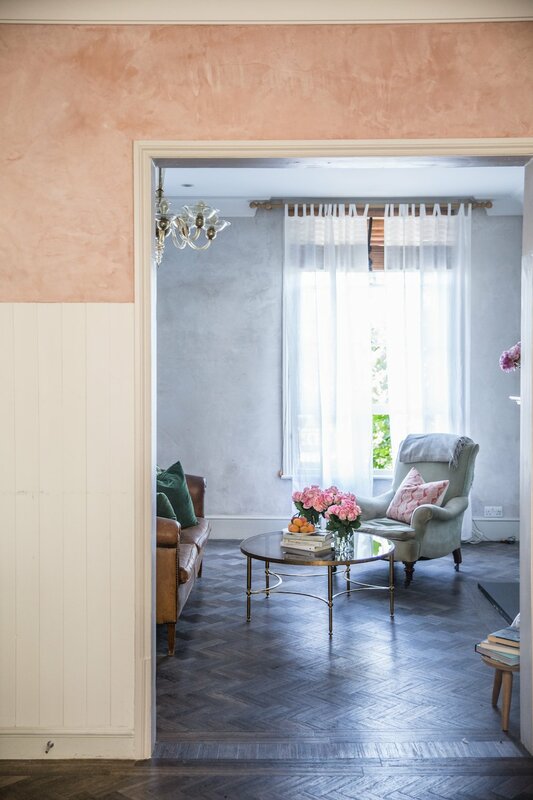 That pink plaster wall and all of those furnishings they sourced are stunning! It’s amazing what ideas they conjure up! Thanks for featuring them! I like the kitchen setting… really beautiful. Love the aesthetic at work here. The light fills the space and makes the jars look incredibly tactile. It feels luxurious, homely yet practical. A triumph! 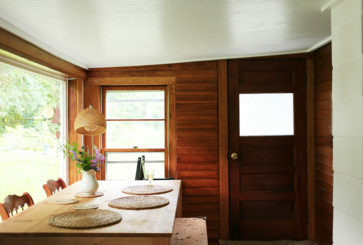 Love the exposed spices in the kitchen…. Always wished I had more of an exposed layout as opposed to cabinets. One day. I am in love with the living room, with the tall window and fresh breeze coming in to allow one to cool down after a hard day at work.. I like the living room, with the tall window and fresh breeze coming in to allow one to cool down after a hard day at work..
What abeautiful apartment! It does have a Venetian vibe, I think the walls do the trick! I love Skye McAlpine and I folow her on Instagram , Pinterest… everywhere! Joanna – thank you for sharing this! 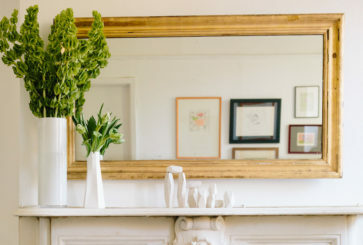 I feel that many of the apartment tours – while all special – similarly fit into the very chic & sleep midcentury modern/eclectic look that your place in Brooklyn has… so I love to see something a little outside of that box. Very cool! The wood floors are amazing. Every room is cozy but chic. I love the distressed and color of the walls in the kitchen and living room. And your couch is just what I am looking for…so cool. She had me at Aeneas! 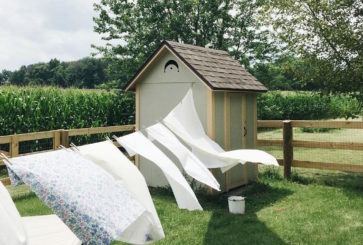 I adore your sons room; what fabric did you use for his window treatments?? Love how well it goes with the wallpaper (which I adore as well! )….I’ve been looking for something similar for some time for my baby boy’s room. This home is ethereal and I want to cozy up in it! Also, can I tell you how much I love that your son’s name is Aeneas?? Loved the kitchen, the modern look of the counter top and cabinets against the vintage feel of the appliances. I wish I had that many flours! 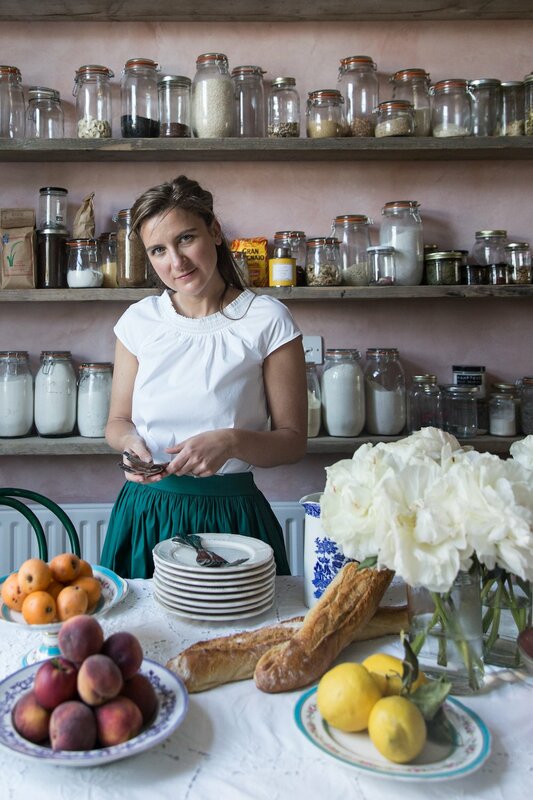 One of my wishes is to have enough money one day to buy all the ingredients for all the recipes I wanna make and not have to think about it, so all those flours are just dreamy to me. And her room is so lovely and looks super cozy. I wish my boyfriend would agree to decorate our room like that, but that’s not gonna happen. I love throws and blankets too, it does sound like a great idea to ask for blankets as presents because I’m always cold lol. And the wallpaper on her kid’s room is so cool, I kinda wanna decorate my nephews bedroom with a similar one. this is just stunning. I’m curious. do you rent or own? also, for the pink walls in the kitchen, how did you go about getting that exact texture and color…is it a plaster? you definitely nailed that venetian villa blush (my favorite hue) and I’m dying to know how. thank you! Gorgeous space! I especially love the way the pink walls are painted. Maybe I missed it in here, but how is that achieved? So cool! I love that you buy less than perfect items to decorate your home e.g., chipped chandeliers. I think sometimes I look for items that aren’t blemished at all but what lovely character it lends and so nice to make your home’s atmosphere cozy and sweet. thanks for sharing. Luring friends into lingering for 5 hours over dinner is exactly my approach to a party at home. I just inherited 6 Thonet chairs, love how they look, but wondered if they were comfortable enough for the long haul. Good to see they work for you! I really like how she sets out the flowers and fruit. It feels considered, yet still casual. Was just thinking the same thing! The Aeneid was required reading for us at our inner city public high school. What a beautiful house! You have made this place truly lovely. 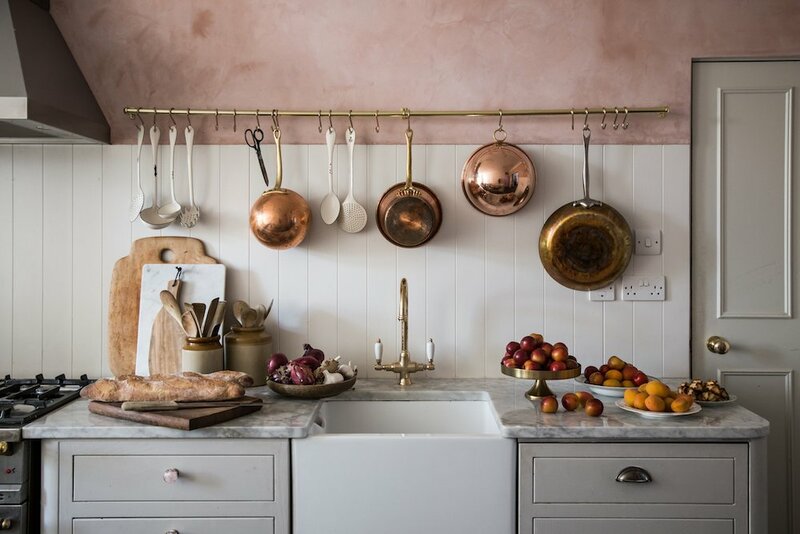 I especially love the copper pans hanging in the kitchen! What a dream! We only tend to say apartment for very modern buildings. Victorian flat, maybe. Thanks for always featuring such quality content – I always love every post. And her Instagram is the very best. Wowwww! This is beautiful. I feel like often the home tours featured on Cup of Jo are all of a similar style (they’re beautiful, don’t get me wrong!) but this is very different, and I love it! Beautiful! 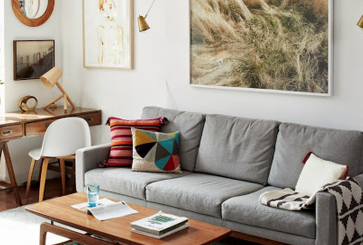 The sofa, coffee table, flooring, parrots, and all that flour – swoon. Completely dreamy. But then I picture kids running amok and Morten Harket’s voice drifting around the gorgeous wallpaper and it adds a really fun, lively, element. Perfect home. Thanks for sharing! Aeneas, such a gorgeous name! I had to look up how to pronounce it, as its new to me. I love that big cutting board. 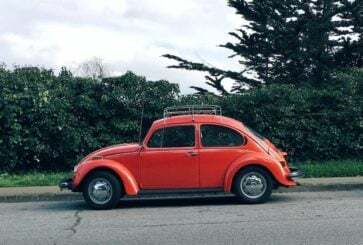 Would love to know where it’s from :-) Thanks! What a great house tour! This place just oozes character. I LOVE it!!! 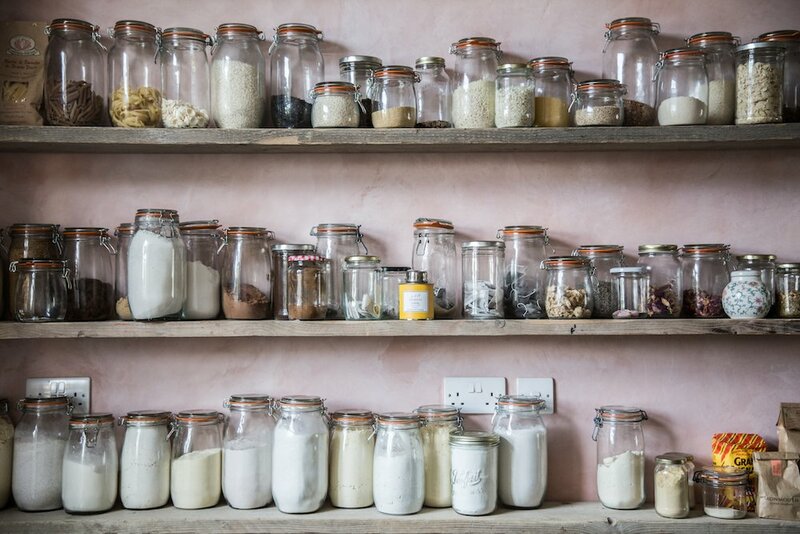 Oh, those rows of jars! curious if you rent or own your apartment? Can you recommend any good used furniture places in central/north? Love this tour! One of the most beautiful charming homes! my favorite out of all that you have featured! It is so cozy! I love the fireplace and mantel, as well as the big windows. I feel as though I am stepping back in time when I am looking at the pictures of the rooms. I love old houses anyway. We live in a colonial cape cod built in 1939, and it has lots of character. I live in Richmond, Virginia, and we have lots of Victorian houses in the middle of the city. Beautiful house! Love the pink! That kitchen is dream! Is it a Jersey Ice Cream Co. creation? I adore their work. Yes! It is a Jersey Ice Cream Co. creation! So glad someone put that together! I also instantly recognized their work. It’s so distinctive and so, so beautiful. I should have known from those beautiful walls! Adore the pink kitchen walls. This is such a beautiful home!! Do you know where’s the wallpaper on Aeneas room from? This apartment is gorgeous! From the wall paper to the flooring, every detail is romantic and dreamy! And ditto on the lovely wallpaper. So refreshing and welcoming. Getting tired of white walls and fiddle leaf figs everywhere! So beautiful!!! 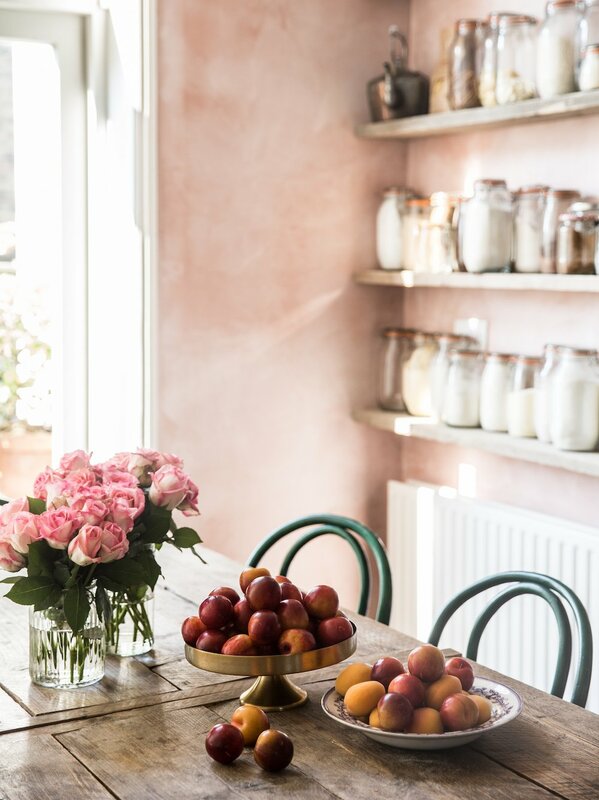 Are the pink kitchen walls Venetian plaster? We used that in our bathroom but couldn’t find pigments we liked so went with the plain tones of the white plaster.? I’d like to be to find a good pigment source. Thanks! Gypsum plaster, not Venetian. Just more of a matte look. Try Guerra Paint and Pigment! swoon swoon swoon. 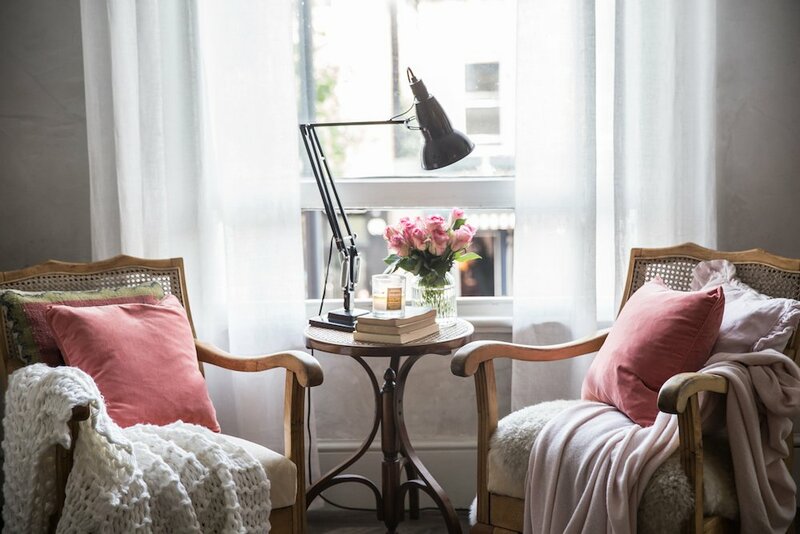 so feminine and charming and cozy and warm. just beautiful. I actually LOVE that kitchen. The shelves and the hanging pans…beautiful. Their place feels so warm! While Victorian isn’t my personal style, I appreciate that this apartment tour is so different from all of the white-on-white apartments that are currently en vogue. I’m curious, how do you pronounce her son’s name? Kathy, I thought the exact same thing! It seems like every home I see on the internet is in the similar mid-century modern vein, with bright white walls. Nothing against that look but I loved seeing something more vintage, even romantic here. When I got to the end of the photos, I was actually sad there weren’t more! One of my all-time favorite Cup of Jo home tours. Do I spy a pink fridge in the corner of the second living room shot?! It’s great to see a home with color on the walls! Where is that beautiful tree wallpaper from?? 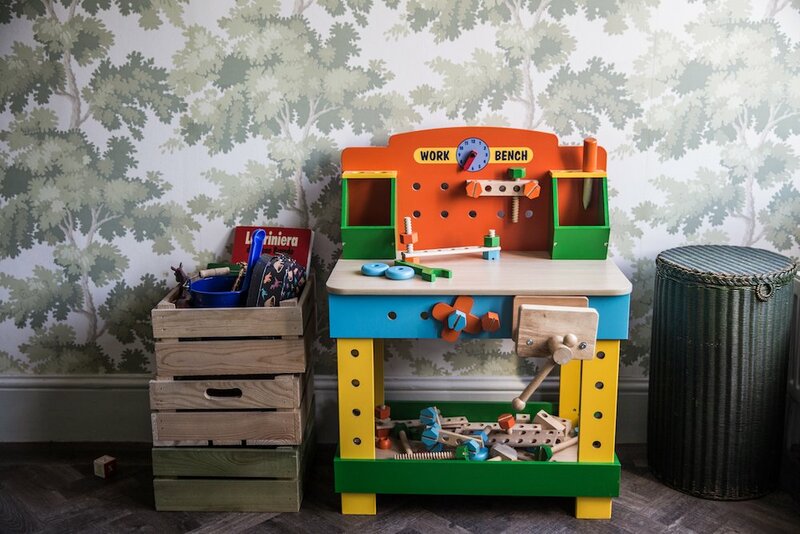 What brand is that amazing toy work bench? I absolutely love the walls and use of wallpaper! I finally decided to wallpaper a few rooms in my home to brighten things up, and I cannot believe the difference it makes! We’re vacationing in Paris right now and its enchanting seeing all the wallpaper hung in old homes and buildings. Gorgeous silk walls, you never see opulence like that anymore! 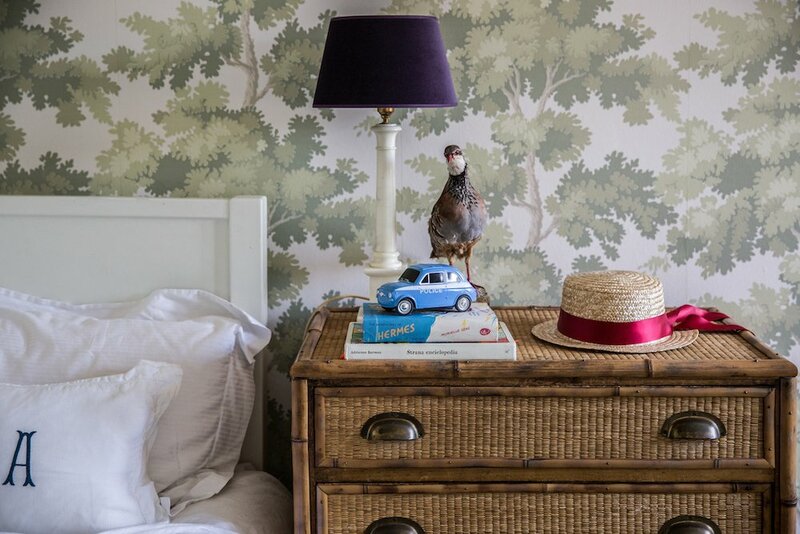 I think wallpaper always adds that little extra touch, element of design which cannot be conveyed simply by painting! Gorgeous!! LOVE the pink, worn-in wall color. Is that a paint technique or wallpaper? Same here, dying to know! Hey all, The walls are Venetian plaster with pigment added to create that dreamy pink color. Percy worked with Anthropologie for a few years perfecting the technique and we use it whenever we can. We had to source some UK pigment we’re not used to while we were over there, but it ended up turning out amazing. Pink plaster forever and ever. It’s a special plaster veneer wall finish that we did. Thanks! I’m curious, too! It looks exactly like tinted Venetian plaster, which is wonderful . . . as long as you never plan to change it, since you can’t just paint over it. The plaster is usually sealed with wax, so you have to remove the wax, at least, and often the plaster, which is an expensive, time-consuming job for professionals. You can get a very similar effect by using sheer washes of tinted glaze or thinned-down paint. I’ve sponged my walls with oil pigment mixed with oil glaze and gotten a similar effect, too. For guidance I used a book called “Paint Magic” by Jocasta Inness. I thought she lived in Venice! I would love to see her venetian flat! Want to burn down my mid-century LA house and live in this pink wonderland now! So, so gorgeous. Looove to cozy feeling of this place. Thank you for sharing, Skye! I’d been wondering where all the good British food blogs were! Thanks Jo and the team for finding me one! All of the blush, navy, and green accents are to die for! That little living room with its navy fireplace and big leather couch. I want to go to there!!! The pineapple lamp made me smile, especially with that lampshade. I love all the pink–it’s warm without being too cutesy. Beautiful parquet floors, too. I basically sat with my mouth hanging open the entire time I read this. WOW. This home is absolutely stunning. This home is spectacular. Love the deviation from the typical Brooklyn aesthetic- more please! I agree! Such a thoughtful comment, I do love NY loft apartments, but that’s just the housing stock where I live so its nice to see great design from elsewhere. Agree! 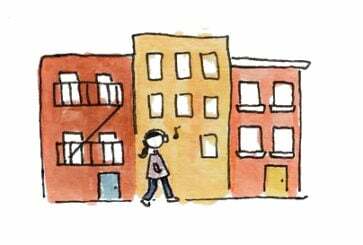 While I love the NYC and San Francisco home tours, I get so excited when it’s a house or apartment from somewhere else. And as a real Anglophile, I say bring on more UK homes! I am completely and utterly in love with that kitchen! I LOVE the colour pallette in the kitchen. The blush pink goes soooo well with the copper, it’s modern but it still looks very rustic.